SLHS has produced books and leaflets on the history of the area which can be obtained from the secretary. Some More Historic Walks (published in 2007) leads the walker around the parish boundary and is in a similar format to the Six Historical Walks Around Shirenewton. There are a few copies available at £4 each. 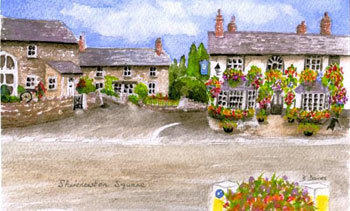 The original drawings are by Barbara Davies and the cover illustrates the village square. If you would like copies, it is available from the society and also at some local establishments and the Tourist Information office in Chepstow. The SLHS also has copies of the 1841 to 1901 censuses which can be viewed at the Resource meetings held each month. For more details see Walks, Talks & News or contact us. Local resource centre: This is our own parish archive which is accessible each month, at informal get-togethers (extra visits by appointment) – they are usually held in the recreation hall. Oral traditions: Recording the memories of older villagers. Photos and pictures: Collecting and copying old photos and pictures for discussion and recording in albums. They are often donated to the society or reproduced with their owner's permission and returned. Books, maps and documents: There is a varied selection to suit every interest. Why not come and find out how to decipher the deeds of your house or explore the tithe map? Some other sites that are related to the Shirenewton Local History Society or may be of interest. Please note that we are not responsible for the content of external websites and that all the links below open in a new window.